OpenSAML can be used to generate metadata. As with reading, the framework is pretty straight forward in relation to the metadata XML. We start by creating the EntityDescriptor, setting the EntityId and building the SSO descriptor. The keyInfoGenerator uses a X509Credential to generate the key info object with the public key. Setting what type of pseudonym federation we want with the IDP. Thanks so much for this example. Would it be possible to obtain the source code for SAMLUtil? Very neat series of examples for OpenSAML. Very much appreciated. What is the difference between uildSAMLObjectWithDefaultName and buildXMLObjectDefaultName? I have had a look at the convenience method link that you have provided, but could not figure out the difference and the necessity between them. It would be very helpful to have any suggestion. Many thanks for your reply. I have been able to generating SP Metadata with your examples, but struggling to find a way to generate IdP Metadata. Any suggestion would be highly appreciated. I have never tried that, but it shouldn't be very much different from SP metadata. I would suggest finding an example IDP metadata file and try to recreate it with OpenSAML. Many of the XML elements in the metadata are represented by OpenSAML classes with the same name. What exactly are you struggling with? Actually, I have been able to generate the metadata. I am struggling with signing the metadata. I have looked into some examples for signing a SAML Assertion, but a bit lost for signing metadata. Any help would be highly appreciated. I have managed to resolve all problems. I did not know EntityDescriptor has a setSignature method. It solved all the problems :). I would be totally lost without your helpful tutorials since OpenSAML documentation is close to nothing. Many thanks for that. Yes that is the one to use. How do you generate the signatures? I will soon come out with a post on how to sign elements. It's on my todo list. Yes OpenSAML is not very well documented. I had problems since I was not aware that the EntityDescriptor had setSignature method. So initially, I used the common XML Signing method which was very lengthy. Once I came to know about the setSignature method the code was neat and was just trivial. Thank you so much for this article. My onlu question is when you say keyInfoGenerator.generate(X509Credential),how do you generate this X509Credential? Do you buy a certificate from some CA? any pointers for creating X509 Credential for a SP? Usually you don't buy a certificate from a CA for this purpose. You can generate one with OpenSSL. how to generate the certificate from openSSL . I know we can generate it with a private key . 1)I want to knw how to provide the issuing entity ID/alias ? thanks for the link . Could you provide me link or tutorial of how to configure the generate certificate/keystore to the CredentialResolver in opensaml . I want to implement my own class by extending that inferface CredentialResolver. Ok. Let me explain you my problem. Currently the saml is using a JKS implemention for signing the saml assertion . its using basically a Base64 encoded value as the keystore and has a public and private keys . So we are using the opensaml KeyStoreCredentialResolver class for it to get the resolver. Now the problem is I want change the keystore from the JKS to openssl. Thank you for the link above but its also using the keyStoreCredentialsResolver to generate the credential. I cannot use it as it will expect the entityID as a parameter in password MAP . PLease HELP!!! Change to openssl? What are you generating with openssl? p12? Why do you change? Yes I need to modify the code FROM JKS to use a openssl pkcs8 file. And I generate a .PEM and then to use it with java I generate a PKCS8 file using openssl . with the code above i am able to sign the but it failing to set the public key . hey stefan, It works great !!! but the generate AuthnRequest xml is missing the attribute . how can i add it. We have to configure it on my local server or we have to write code for this. what is use of this metadata please suggest. I am trying to use Generating metadata with OpenSAML to generate metadata to a given entity Id..Is it possible to share a code base for SAMLUtil class to me? hey Stefan, could the above be simplified more ? 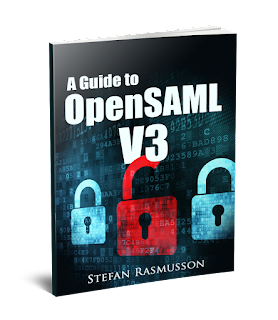 I'm completely new to SAML2.0. I got a requirement to implement SP for one of our company product. I bought your book and is really helpful. I'm still confused with few questions. Can you please clarify my questions? I'm trying out service provider implementation on my local. Let us assume I have SP metadata that has my localhost url references for assertion consumer service. do that at all? Is that recommended? environment even if the IdP runs on https? Basically I have to make sure sso work as expected before I move to development and then to production. Also our development environment does not run on https. I am really confused when it comes to testing part. Just for clarification, I have no control on IdP side. All I can request from IdP side is their metadata (both test and prod accounts). To test you basically configure the SP and the IDP with each others metadata and then start a authentication from the SP. How this is done depends on the IDP. Yes you typically exchange the metadata with the IDP. If the IDP only accepts https and you con not control it then you will need use https for the IDP endpoints. However you can of course use http for you endpoints.